Finished in red (there are only approximately ten red microwaves on the market), works well - pretty good value too. You'll either love or hate the design - slightly resembles an old radio, albeit with a mirrored front. 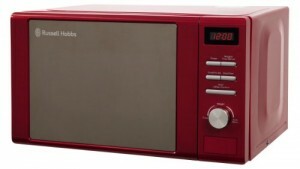 This microwave from Russell Hobbs will appeal to those with a red colour scheme in their kitchen. If you have a red toaster and kettle, then you will be slightly limited in options if you'd like a microwave to match. The Russell Hobbs RHM2064R Microwave, released as part of their "Heritage" range, is finished in a glossy and slightly metallic red and has a retro feel to it - one reviewer commented it slightly resembled an old radio. It features a capacity of 20 litres, and 800w of power - which is fairly standard for solo microwaves in this price range. The controls were simple to use, and the clock took a matter of seconds to setup. There are in all honesty a lot of similar microwaves on the market, in terms of specification and price, and this is in no way a criticism of the RHM2064R, but the main reason for buying this model will be if you like the design and colour scheme. 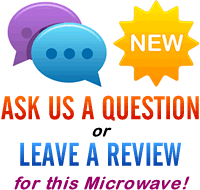 That said, it works well, and cooked food without any issues - all of our reviewers were impressed with the build quality. We tried it on a variety of dishes, from simple defrosting jobs to more elaborate recipes, and each time it cooked as well as any of the competitor's microwaves we've tested. Essentially it's a functional and reliable red microwave, which will appeal to those who have an affinity for the colour red or simply want an appliance to match their new kitchen. A functional red microwave - and one that stands out slightly in terms of performance - it will certainly appeal to people looking for a red microwave. Works well, and pretty reasonably priced, with a high level of materials used in it's construction.